The 4th edition of the glaucoma guidelines by the European Glaucoma Society (EGS) was released in 2014. 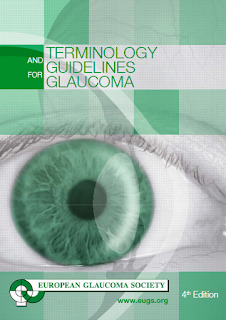 The aim of these guidelines was to present the view of the EGS on the diagnosis and management of glaucoma. The recommendations are intended to support ophthalmologists in managing patients affected by, or suspected of having, glaucoma. The main bulk of the guidelines consist of 3 extensive chapters running around 190 pages, compared to around 115 pages in the Asia Pacific Glaucoma Guidelines (APGG). This makes the European guidelines slightly cumbersome, compared to the concise "easy-to-read format" of the APGG. Nice post. Save the light of your eyes by treating glaucoma at the earliest stage with dentalsave with very helpful Vision plans that offer exciting discount in any ophthalmological treatment.